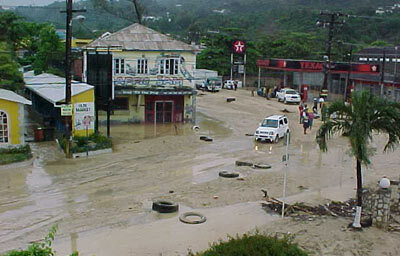 Mud washed down from the surrounding hills covers the streets of Ocho Rios after April flood rains. Prevention better than cure. The mantra is just as good for health as it is in the areas of environmental and disaster management. How much was preventable of what happened when Jamaica’s north coast tourism town of Ocho Rios was flooded as the world prepared to observe Earth Day 2008, or when scores of costal residences were destroyed by Hurricane Dean in August 2007? There seems to be a huge disconnect between Caribbean Joe and Jane Blog’s awareness of how their actions impact on the environment. Media reports on the Ocho Rios flooding, which displaced more than 60 families, may have had as much to do with planned ands unplanned building and other activities in the overlooking mountains as it did the weather – an act of God or nature. There are scores of environmental and community organisations around Jamaica and its CARICOM neighbours and umbrella bodies like the Caribbean Conservation Association (CCA) which comprises both governments and non-governmental membership. But such organisations are grossly underfunded and undersupported, even with their noble purposes. Take the CCA as an example. It has consultative status at CARICOM in its area of specialty and in 2000 was charged with implementing a Euro 10 million programme to develop projects in sustainable livelihoods in CARIFORUM countries. The aim was to show that communities, such as Ocho Rios, could develop and benefit from their availabkle resources in ways that allowed decent living standards while shepherding the resources. But even as the CCA was the implementing agency for such a significant project across more than 12 countries from the Bahamas in the north to Belize in central America and Suriname in the South America, the organization was struggling to afford an executive director and a small administrative staff. While the work it does needs to be communicated to its stakeholder members and the wider public they offer to serve, the CCA’s Web site seems not to have been updated since 2006 and it is more than likely related to underfunding and flowing from that, insufficient staffing. On the other side of environmental coin (natural and built) is the disaster preparedness and response segment. As with the conservationists, they are stacked in pyramids on local emergency response, health and other related teams to inculcate safety measures to help avert disasters and lessen the impact and help us recover when they do hit. The Caribbean Disaster Emergency Response Agency, like the CCA, is headquartered in Barbados as a coordinating body for local affiliates. And like the CCA, CDERA must do its work under a tight budget. Last weekend, FirstCaribbean International Bank was in a celebratory mood as one of the first recipients of a joint FirstCaribbean/CDERA Disaster Management Scholarship, joined CDERA’s staff after successfully completing graduate studies in Planning and Development. As Programme Officer to the Tsunami and Other Coastal Hazards Warning System Project, Roché Mahon, the will be active in empowering coastal communities to prepare for and respond to tsunamis and other coastal hazards. The project is being implemented by CDERA with funding from the United States Agency for International Development/Office of U.S. Foreign Disaster Assistance (USAID/OFDA). Mahon of Trinidad & Tobago, was one of three recipients who received the first grants, which were awarded in 2006. She conducted research in Grand Anse, Grenada, for her MSc thesis, using the experience in reconstructing its coastal tourism belt to investigate the role that physical planning plays in linking disaster risk reduction to sustainable development. “This was a natural choice given that I had previous training in tourism management and that I am particularly interested in coastal zone management. When the region was hit by Hurricane Ivan in 2004, I realized that this was an excellent opportunity for me to find ways in which one of the region’s main industries can build resilience against the devastating impacts of events like Ivan,” Mahon said. She added that the lessons learnt from her study would be of interest to other states in the Caribbean where the physical development of the tourism sector is an integral part of the islands’ economic development. Organizations like FirstCaribbean and other businesses, the European Union, USAID and Canadian International Development Agency are playing their part. Hopefully the governments and the citizenry will do their part to ensure that the work of the Roché Mahons does not stay on shelves gathering dust to be washed away in the next heavy rains because we did not heed the advice she offered, ensure that she is well rewarded and not frustrate her into taking her skills to a place where people show an appreciation for her role.